Here we are on the full moon cycle. The first full Moon of 2014 is in Cancer. 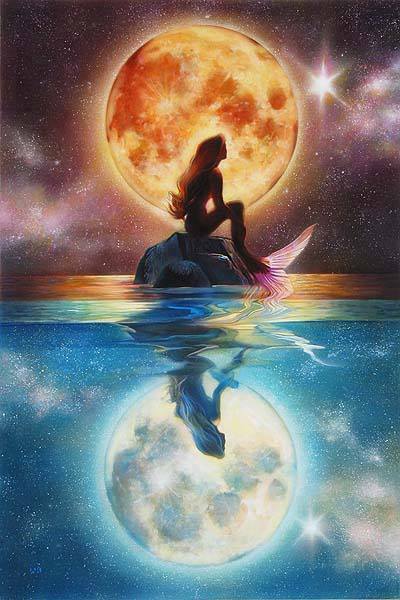 This moon heralds in a very emotional time of release as we continue the calibration process of morphing into new beings with all our DNA strands intact. By now, we have realized that sound frequencies are very important to this process. Sound in itself is the backbone of our societies. It is not enough to refine our eating habits and thought processes, we must consider the interference we receive daily through sound. This, like hypnosis, influences our thoughts and our own spoken words. What are we listening to?? Think about it, this involves yet another level of release. Especially on this hyper-sensitive cycle, sound is crucial. Our bodies are being retooled and elevated and our senses are activated at higher and higher frequencies. The intense solar flare and sun activity are initiating yet another level of intense energy. Let’s be conscious of the sounds around us. Let’s choose what we desire to listen to instead of being bombarded with others programming. Let’s be conscious of the sounds we are emitting. Let’s be conscious of our thoughts and words. Let’s get out into Nature without a headset and listen to ourselves and the natural world! This is a quiet, nurturing cycle and there is a real reason behind this timing. This is going be an amazing year of discoveries, mind-blowing inventions and futuristic promise. Space is needed. Inner-space, outer-space and quiet space! Let’s honor ourselves by giving ourselves quiet space every day. Let’s cut out some of the busy! Many of us are hearing high pitched ringing and feeling changes in our bodies, refined eating, exercise and sleep patterns, dreams vividly remembered and many other seemingly paranormal tidbits. This will intensify. Go with it! Let’s take the most gentle path available to us at this time. We are worth it! This new world needs to be peopled with love. We are that and so much more! Blessings to you on this wild ride called 2014! 2014 is a powerful year. The Chinese Year of the Horse officially starts January 31 yet we are feeling the energy NOW! After living close to a Paint Horse named Happy for the last four and a half years and observing her intense intuition, I believe we are in for a highly intuitive, telepathic and persnickety year. Yes, fussy, finicky and difficult to please like a small child or choosy, exacting and focused on ONLY what we want. AKA- Let’s focus on our SELVES and what WE need and want to be happy, harmonious and creatively productive. This may seem selfish yet when we understand the reality of this earth dance we are all involved in, we begin to see that everyone is self-involved at core. We come in this way and go out this way. Accept that! Spending a little time in the first three months of this year on ourselves, while Venus, Mercury and Mars retrograde, is the name of the game for this winter 2014. This is going to be a challenging year on many fronts because we are walking between dimensions. This means that we have one foot in the third dimension and most of our body in higher dimensions when we stay positive and grounded in simplicity. Most of our body in the third dimension and one foot in higher dimensions when we are stuck in competition, jealousy, greed, consumption, addictions and low self-esteem. This is a year of choices. We are immediately reminded where we are placing our energy by how we feel. Yet, it is challenging to be in places where others are choosing (consciously or unconsciously) to cling to the old world. We can choose to understand that we are modeling a new way of being for them so that they know they have a choice. So you see, there are choices in both worlds. Learning to deal with resistance to us by others and resistance to move past deep, self -sabotaging patterns in ourselves is one of the challenges of 2014. Hopefully, we have abandoned swinging the pendulum and are working hard to stay balanced this year. Balance is the major 2014 theme. To stay in our heart-center is another challenge of 2014. These challenges will be enough to work on throughout January as Venus retrogrades in Capricorn as relationship issues and finances get the red light for retooling! Magic is galloping all around us this year yet we have to open avenues to receive. Think about this now. There is great momentum happening beneath the surface in this first month of January. Submerged in our collective and personal psyches are great problem-solving abilities. How do we access them? Hiking, biking, walking, yoga, tai chi, meditation in nature? Make time for some ritual alone time to contemplate. In many ways we are resting up now for a power-packed Spring! Blessings and Magic abound for us all! PMS Boil that 2014 resolution list down to the three priorities and work those. Simplify all lists. No need for more overwhelm in a persnickety year.